And the internet never forgets.. out of no where I got a message from Mike Higgo who used to get in touch back in the day with edits from about the Crewe and Wrexham areas and then today he hits me up with a new edit from rider Andy Skinner on a night mission at Boneyard Skatepark over in Chester. I haven’t been in years and im putting this back on the list of places to hit up. Would be good to go visit the park as it still looks mint to ride and i’ve met many a good friend there over the years back when I was working for Ride UK and Seventies. Anyways enough of my waffle, enjoy the edit of Andy and his four pegs and a coaster trickery, some good tunes provided by Tame Impala for good measure! I’ve just walked through town and the lights and Christmas decorations are still everywhere to be seen so im guessing posting this three days after it went up isn’t a bad thing really.. The lads at Foundation BMX have just put up there Christmas edit filmed at the Boneyard Skatepark down Chester way.. enjoy the ride! Phil Demattia has always been one of the most interesting riders to watch in my books. I mean the guy can 270 double crank flip! which other rider do you know who does that kinda stuff? I knew Phil was awesome already, but this Boneyard edit for Éclat simply blew my mind when I watched it! The fast paced music and weird vibe to it really seems to suit his style and personality very well! – Apart from the brilliant editing and song choice; bike control, creativity and skill are what makes Phil D’s riding so impressive to watch. This is an amazing video made by the Albion of Owain Clegg. As they describe he’s been there since the beginning, so much so that he’s pretty much part of the fixtures, Owain knows every nook and cranny of that place and the following video shows that off perfectly as he rips around the Boneyard, carving up every line that’s there in classic Clegg style. Loving the original footy and the 80’s/HD mix that goes on during the session! 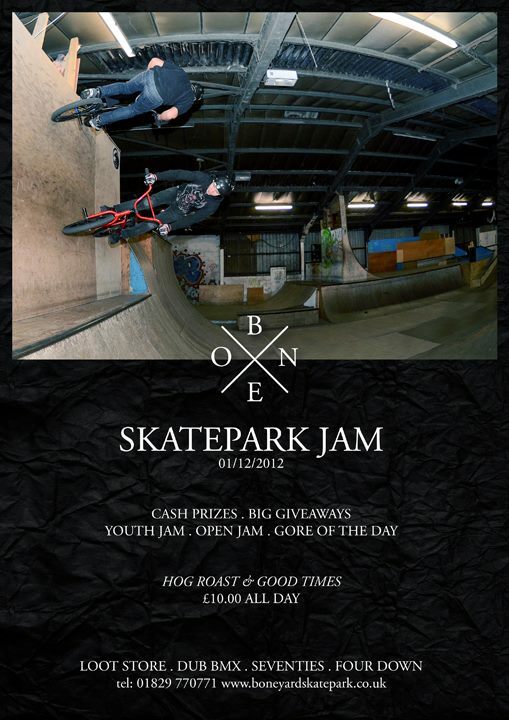 Thanks to Owain Clegg for reminding us that the Boneyard Skatepark Jam is happening this weekend down in Chester. All the details you need can be found here http://www.streetphire.co.uk/event/boneyard-bmx-jam-2012/ and also on the flyer attached to this post.